The download button will appear on the right beneath the preview. Note: Please rename the downloaded file if you want to save it to the same directory from where it has been uploaded. The system doesn't give a new name to your file. The quality of preview photo is not suitable for printing. If you want to change the cropping or the color settings, then click on the back button. Print the downloaded photo with a photo printer. Use good quality photo paper for printing. Use the printer's own software, because with it you can set the proper (9x13 cm = 3.5x5 inch) print size. Not use the Windows' own image viewer software for printing, because it always resizes the photos to be printed. 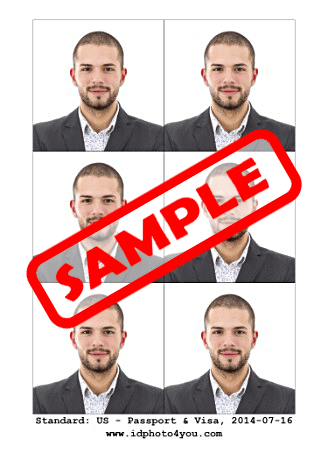 If you do not have your own photo printer, then you have to get your photo printed in a digital photo lab. Please give the proper (9x13 cm = 3.5x5 inch) size when you order the print. Cut up the printed photo along the black lines. The date is given in ISO 8601 format (UTC/GMT +1 hour).